How does Agroecology countribute to the achievements of the SDGs? In the BAU scenario, it is assumed that current policies are continued into the future. The interventions implemented in the AE scenario are inspired by Andhra Pradesh’s Zero Budget Natural Farming (ZBNF) approach  and cover the FAO’s 10 agroecological principles  . With the selection of ZBNF-related interventions, it is ensured that the interventions have been successfully tested and applied in a real context on a large scale by hundreds of thousands of farmers in India . identify the individual contributions of each policy as well as emerging synergies. Based on the analysis provided in the full report, this summary focuses on the key findings related to the implementation of Agroecology to improve the SDGs. The explorative scenarios are not to be taken as precise forecasts – which are not feasible over the time horizon considered. They have been designed with the purpose of informing a comprehensive policy process to support SDG achievement. The iSDG simulation analysis led to 8 key findings regarding the assessment of the impact of a set of agroecological interventions for a typical semi-arid African country on the achievement of all SDGs. The overall performance is improved by the AE scenario. For example, in 2050 achievement is 41% in the BAU, while it is 50% assuming the implementation of the AE scenario. in the AE scenario compared to the BAU: SDG 2, 11, 13 and 15. Eight goals show performance increases between 10 and 35 per cent in the AE scenario compared to the BAU. 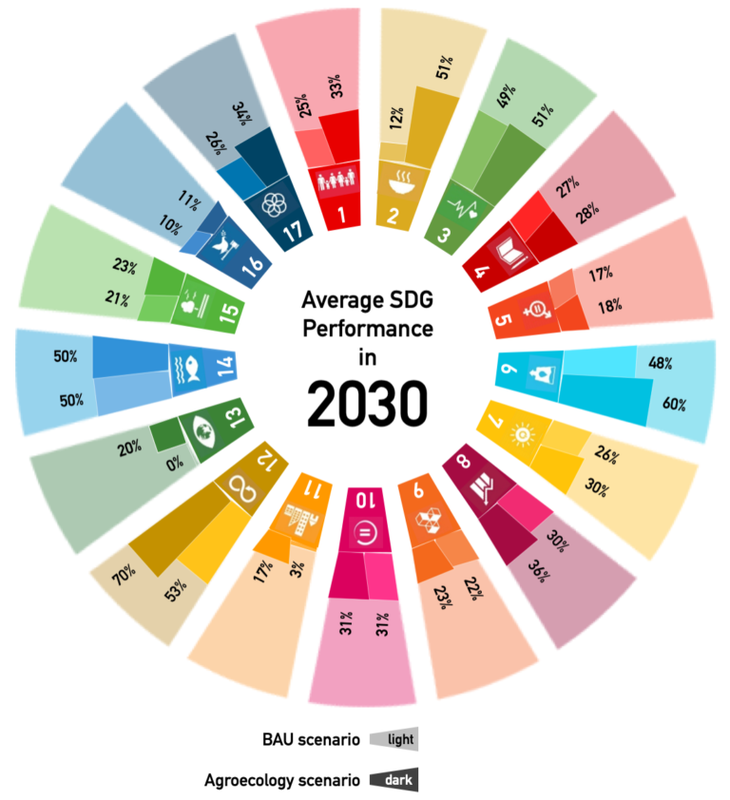 For three of these goals (SDG 6, 7, 8) the advantage decreases at some point between 2030 and 2050, but for five goals (SDG 1, 5, 12, 16, 17) the advantage persists. as the assumed interventions have been inspired by ZBNF, an approach that has been successfully tested and applied in a real, large-scale context in India. Further, the simulation reveals that the AE scenario does not necessarily require additional government expenditure but can even facilitate its reduction. The precise scale of improvement and the concrete changes necessary to generate improvement must be analysed based on country circumstances. Consequently, the scale of improvement depends on the country, and specifically on the scale of changes, meaning that smaller changes (for example because the application of agroecological principles is already widespread) also generate smaller improvements, and vice versa. 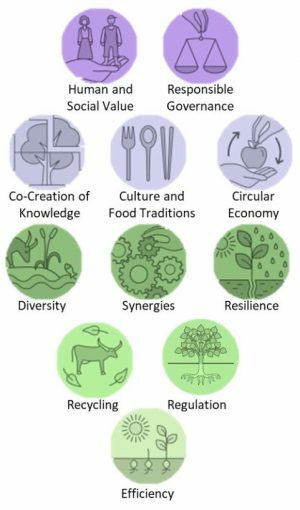 Synergies contribute to the Agroecology improvements, revealing that it is composed of concerted interventions building a comprehensive scenario in which policies support rather than counteract one another. Synergies emerge when the joint implementation of different policies is higher than the sum of achievement of each single policy, and they have been identified, for example with SDG 2 (Zero Hunger). Additional policies in other sectors are necessary to fully achieve or at least improve SDG attainment. This is true for SDGs with rather remote connections to agriculture as well as those with close connections. For example, even by tripling the achievement of SDG 2, it is 66 per cent in 2050 in the AE scenario, indicating the necessity of additional policies addressing, for example, unemployment and poverty in other sectors. The generated improvements are caused by generic interconnections, so their existence can be expected in other countries and dynamics can be generalized. 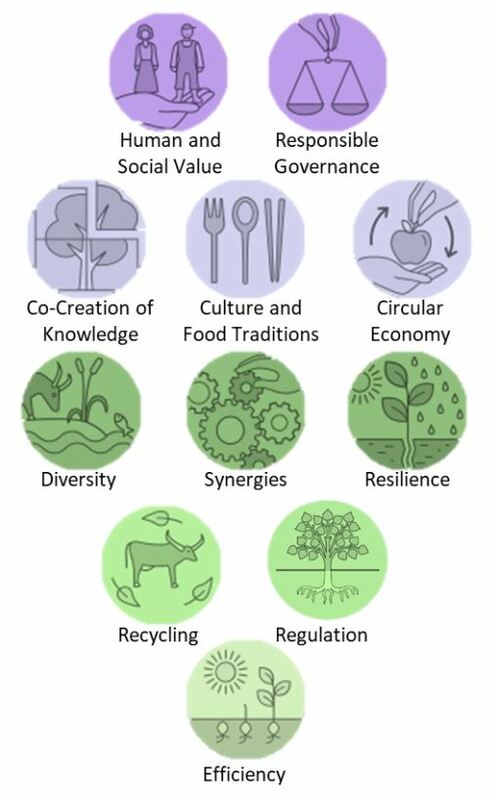 The interventions (based on agroecological principles and presented in the green and purple circles) affect key variables of the system that pass the change to further variables, some of which are used to measure the SDG achievement levels. 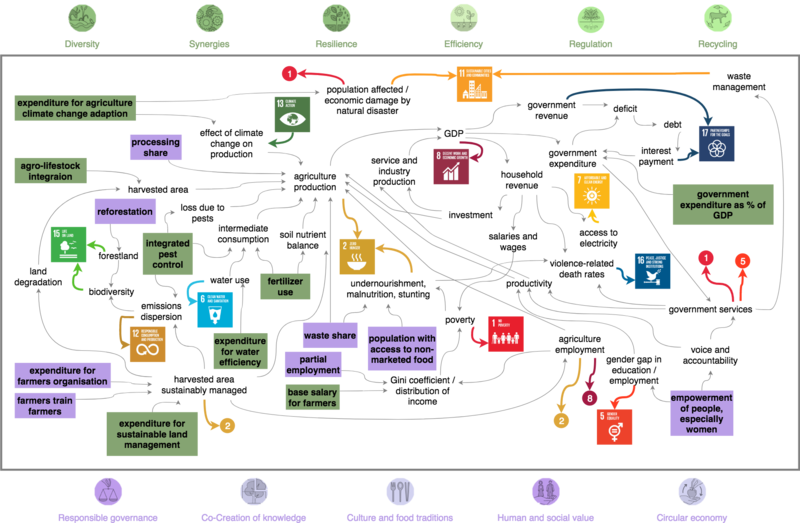 The figure shows the interlinked nature of the system and that changes in agriculture spread to economic, societal and environmental spheres and to various indicators of nearly all SDGs. In addition, the figure shows the inherent positive feedback loops that can be activated by changes in agriculture, starting a process of positively reinforcing developments. The analysis reveals significant delays between policy and effect, indicating the need for quick action. For example, a strong increase of expenditure for reforestation starting in 2019 only leads to a very small improvement of SDG 15 (Life on Land) in 2030, while improvement is significant in 2050, indicating the time needed for changes in specific intervention areas such as forest growth and regeneration of land and soil, as well as education and training. 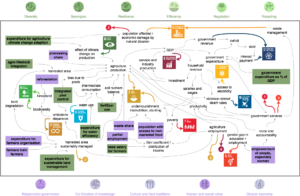 To assess SDG impacts, there is a need for comprehensive long-term analysis that integrates the interaction between different spheres, feedback loops and time delays, and that enables the identification of synergies. Such integrated analysis demonstrating potential widespread and long-term impact can be helpful to increase acceptance for interventions that first need effort and that generate positive effects only with a long delay, fostering the implementation of policies that truly increase sustainability.